I know I am way past the expiration date on this half gallon of soy milk, but I feel the need to preach after stumbling upon A & E's random showing of R.J. Cutler's documentary The September Issue last week. Like every good fashionista who's been reading Vogue since the age of 13, I thought I knew everything I needed to know about Anna Wintour and co. Furthermore, the countless (and some might say, unhealthy) number of times I've watched The Devil Wears Prada makes me feel like I'm even more of an authority on all things Anna. Boy, was I wrong. And thankfully so. 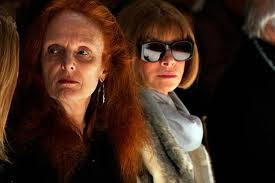 This documentary about two completely self-actualized women - editor in chief Anna Wintour and creative director Grace Coddington - is nothing short of awe inspiring. Wintour knows who she is, what her job is, and oh yeah, what you think of her too, so she's gonna live up to every iota of that expectation. An Italian reporter rudely asks her as she's sitting front row waiting for the runway show to begin why everyone refers to her as an "ice woman." Without waiting a second, she replies, "Well, this week it's been pretty cold." She knows her role and plays it like Meryl Streep. But more Sophie's Choice Meryl than Prada. I also adored when she talked about being young and filling out an application that asked for her goal in life. Her father - an English newspaper editor - told her to write "editor of Vogue." So she did. And the universe listened. The importance of specifics, darlings. The crown jewel of Wintour's empire, no doubt, is Coddington. Her frizzy red locks and gorgeously artistic soul are the true spirit of the magazine. The love and care she puts into the photo shoots is mind numbing. And as Fred says, she's just so damn cool. New York Times uber scribe Maureen Dowd calls her the Keith to Wintour's Mick. I couldn't love that comparison more. Her comment on no one seeing the beauty in a blurry or out of focus photograph spoke to me on so many levels. Everyone wants everything so "sharp and crisp," she states. It's a comment that can be applied to the entire state of our artistic culture. Music, film, and even books, have lost all their depth because of all the automated fine tuning that goes into everything appearing and sounding "perfect." What the hell is perfect anyway? Certainly not Coddington's hair, or mine either. Watch this film.